Our Make a Garment a Month Year is nearly over for this year. Amazingly - and some great work has been done by all of us. This month it will be getting cool in the northern hemisphere and warmer in the evenings here. It's time to make something to suit the long nights in your part of the world, and the nice sunny evenings in our part of the world. 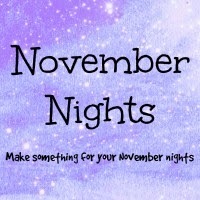 So, make something for your type of November nights - whether nice warm leggings, a fleecy something or other , or something cool and summery down under or if you are in a warmer climate. Over to you to make whatever takes your fancy.